The sweetest set-up curated by Betsy Lanphier that has us ready to prep an intimate tea party with India Armory's gorgeous linens. We love her combination of the purple clover and barely there peony pink print accompanied by simple crystal bowls, blue and white dishes and winter citrus. PEEK INTO THE POPPINS' RESIDENCE. Find out how the art directors for Mary Poppins Returns wanted to differentiate the home's decor from the first film and a few furnishings they were able to salvage and utilize for the much anticipated sequel starring Emily Blunt. There are so many fantastic layers to this West Coast home by Amber Lewis Interiors. 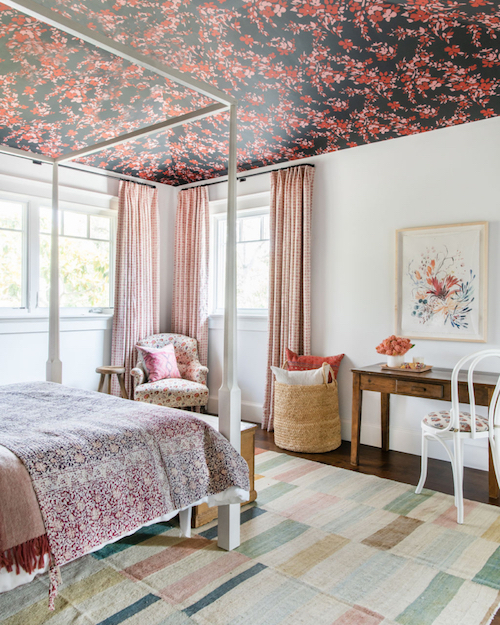 Would you dare cover a ceiling in wallpaper? We don't hate how it turned out in this little girl's room. Fellow rug fangirls, don't skip this feature. Sure, this news byte is two years old, but if you never tuned in to the Netflix documentary series, Abstract, do. Start with Ilse Crawford's episode, and you'll find it hard to resist watching the rest.